Do you like fudge? This is the best part of fudge without the headaches that making fudge can bring. The secret ingredient? It's the first ingredient listed, surprised? So was I, but I had to try it. 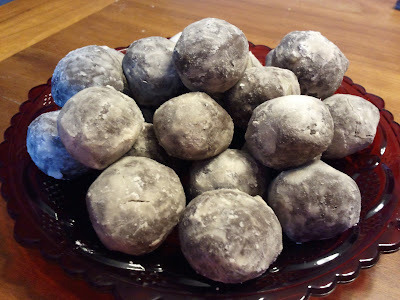 I couldn't believe that I had even used it when I tasted these "Trailer Truffles" (now you know why they are called that) . Try making them yourself, and then when you taste these, you won't believe it either. Boil water in a double boiler and then add the butter and cheese to melt. Stir until all of the cheese and butter are incorporated together and then add the vanilla and nuts. In a large bowl, sift the Cocoa powder and powdered sugar together. Pour the butter, cheese, and vanilla into the sugar and Cocoa and mix with a spatula. If necessary, mix with clean hands, make sure all of the powdered sugar is incorporated. While the mixture is still warm, scoop into 1 inch balls and place on a cookie sheet lined with wax paper. Allow to set in the refrigerator for 1 hour and then roll each in powdered sugar, shake off the excess and serve at room temperature. You can use any kind of chopped nuts you like. If you don’t have a double boiler you can create one by placing a metal or glass bowl over a pot of boiling water. This is a great Spring and Summer salad. The crunch from the watermelon and the tartness from the tomatoes all get mellowed out by the Feta cheese. Pretty as a picture! Oh, here's the picture. 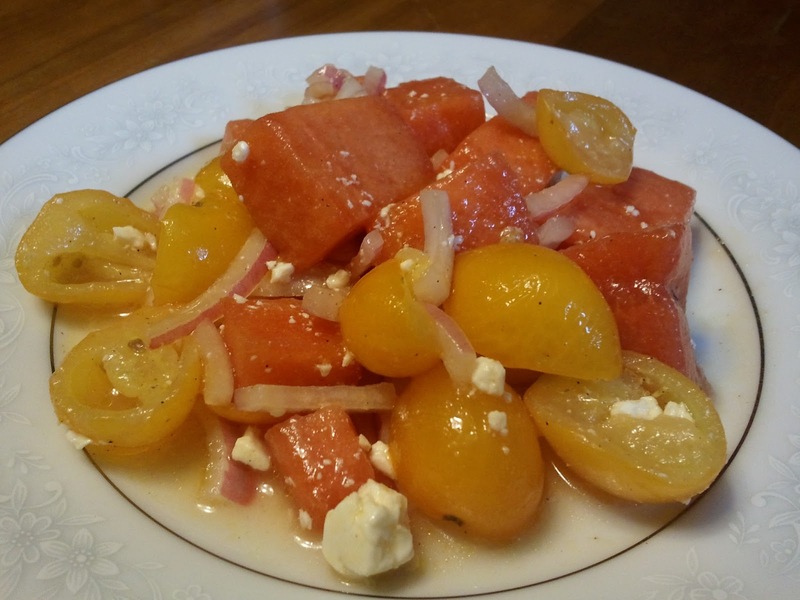 Combine the watermelon and tomatoes in a large bowl; sprinkle with sugar and salt and toss. Set aside for 15 minutes. Drain the excess juice; add the onions, pepper, vinegar and oil and toss. Cover and refrigerate for 2 hours; sprinkle the feta into the bowl before serving. If you can’t get the Sunburst tomatoes, you can use Roma tomatoes cut into cubes. The yellow tomatoes give the salad a great color contrast, but it is not necessary. The seeds in a Roma tomato are sometimes bitter; I usually squeeze the tomato and remove the seeds, before cutting them for this salad. These are great as an appetizer or even as a weeknight dinner. I had these at a brunch and I knew I had to make them myself. 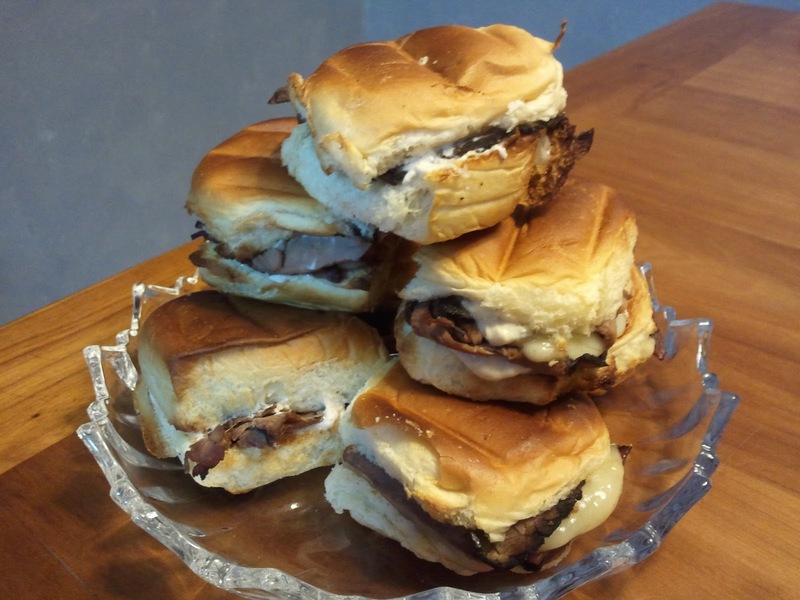 Cut the Swiss cheese into ¼’s, cut the slices of Roast Beef into ½’s, and cut the rolls in half. Add a ½ slice of Roast Beef and a ¼ slice of Swiss cheese to each of the 24 pieces of rolls. Place the rolls on a cookie sheet. Toast the sandwiches for about 3 - 4 minutes or until lightly browned. Place a top and a bottom together and press down on each sandwich. Open the top of each sandwich and place a dollop of the Horseradish Cream Sauce on each. Make the Horseradish Cream Sauce the day before you want to make the sandwiches. This sauce is what makes the Mini Roast Beef Sandwiches extraordinary. The sauce needs some time to develop, so make it the day before you wish to serve it. Combine all ingredients and refrigerate for several hours before serving or overnight. This is great to make when you making Roast Beef Sandwiches or when you are serving a Beef Tenderloin. I use the fresh prepared horseradish from the refrigerated section at the grocery. I use red wine or apple cider vinegar.